Club Carlson’s “Big Night” promotion is back and this time not only can you earn bonuses staying at hotels worldwide, but you can actually stack three separate promotions into one and earn up to 138,000 bonus Gold Points. Here’s how. First, let’s talk about the “Big Night” promotion—or rather, all three stackable “Big Night” promotions. You have to register separately for each promotion on its individual page and complete a stay starting on or after May 15 and checking out on or before July 15 to qualify. All registrations will go live at 12:01 am CDT on May 15 (and May 22 for the Country Inns & Suites). Even a single night counts as a qualifying stay, so if you can book some cheap rooms at various properties, you can really maximize this deal. 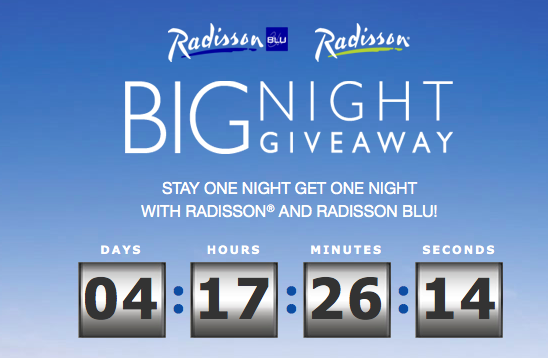 The Radisson promo clock is counting down to May 15. 50,000 points: Radisson/Radisson Blu. Here is the promo page where you can register starting on May 15. Then, when you stay in a Radisson or Radisson Blu property for a night, you earn 50,000 points. 44,000 points: Country Inn & Suites. Again, you have to register directly on the page for this specific promo, which you will be able to find here. 44,000 points: Park Inn by Radisson. Begins May 22 and active until July 22 from what we have read, though no official terms have been posted. The registration link will supposedly be here, though it does not seem to be working at the moment, but keep checking back and please report when it’s up! Terms & Conditions: Carlson hasn’t released the exact terms yet, but it’s likely that only the first 100,000 members to register for the Radisson/Radisson Blu promotion will get the full 50,000 points, and thereafter people will just get 15,000 points. For the Country Inn & Suites promo, the first 35,000 registrants will get the full bonus, and thereafter, registrants will get 15,000 points; and for the Park Inn promo, the first 20,000 registrants get the full promo, and only 15,000 points thereafter. Again, this is speculation. Also, it’s likely that each Club Carlson account will only be eligible for one of each bonus, that the bonus is not valid on existing reservations, and that the member must be there in person to check-in and check-out. I’ll report back as soon as the verifiable terms and conditions are available. 138,000 points is enough for almost three nights at a Radisson or Radisson Blu property (they cost 50,000 points for a free night redemption). Granted, in terms of hotels that cost only around $200 a night, of which there are plenty in the Radisson family, that’s not so impressive, but when you consider using these points at properties like the Radisson Blu Ambassadors in Paris or the Radisson Blu Resort Marina & Spa on St. Martin where rates are regularly in the several hundreds of dollars, you could be saving some real money here. Alternatively, you could use your 138,000 points to spend 15 nights at Carlson’s Category 1 hotels, where free nights cost just 9,000 points. Even if you don’t want to redeem for free nights, 100,000 Club Carlson points = 18,000 airline miles, so overall this promo could net you a lot more airline miles after 3 stays vs. Hyatt’s summer airline mile promo. All you need to do is email them here and include a screen shot of your current hotel elite status, your Carlson GoldPoints number and request a status match. Even if you don’t currently have elite status in another program, you still have time to register today—the deadline is May 11!—for the 90-Day trial Hyatt Platinum status with an eligible Visa Signature card like the Sapphire Preferred. Try to get the status match before your qualifying stays so you’ll earn an extra 6,000 points from making your reservations online at clubcarlson.com and let’s say you spend a total of $100 on all your three qualifying stays with 50% more points on them thanks to your status (for a total of 450 points). Suddenly Club Carlson is looking a lot more interesting.